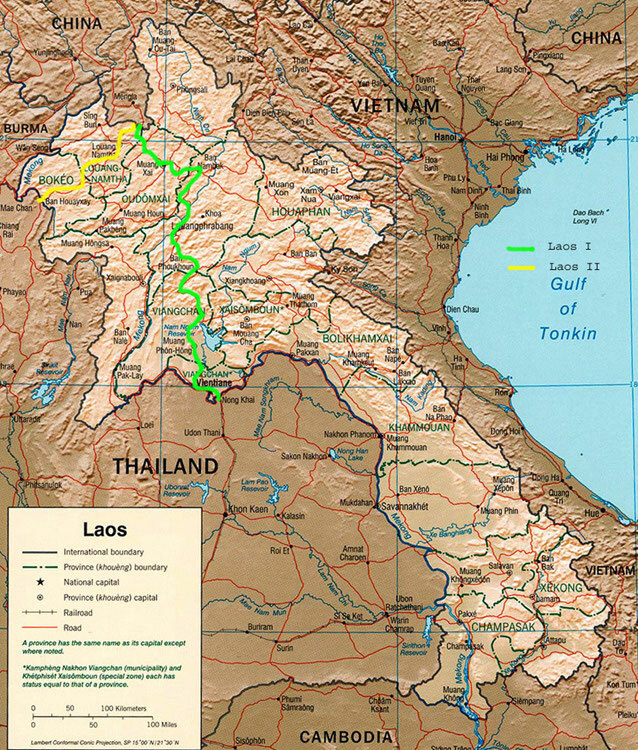 261 km of cycling - as part of a bicycle world trip - from the Chinese border southwards across northwestern Laos via Luang Namtha to Mekong River at the Thai border. 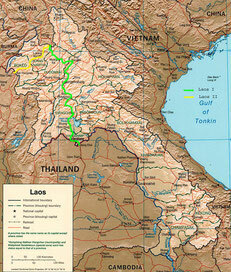 Do you like Cycling Laos II? After a last night in China, we went in the morning past the stepping stone guard in the Chinese guards to the Laotian border post, which cost us US $ 30 per person for the visa on arrival. Surprised we drove the 20 km, which we had come a month ago on bad construction site, pebble and bumpy piste, on now freshly paved road at a rapid pace to the south. But the fun was over quickly and he should also, we did not suspect, to come back to the Thai border. So we went via Luang Namtha on the route 3 through extremely remote areas in the northwest of Laos. Mostly at a snail's pace, we shook through layers of dust and sand that were centimeters thick, over fist-sized pebbles, through endless construction sites, sometimes steeply uphill and downhill. The view of the sporadically emerging mountain villages was often obstructed by dust clouds of trucks standing in the air for several minutes. The fine sand turned us and our wheels into red-brown ghosts and sweating I swallowed tons of dust. Sometimes we were lucky enough to have the runway watered by a water tank truck before going through sticky mud, slippery up and down. After 240 km it was finally over, we were in Houayxai and only separated by the Mekong from Thailand.